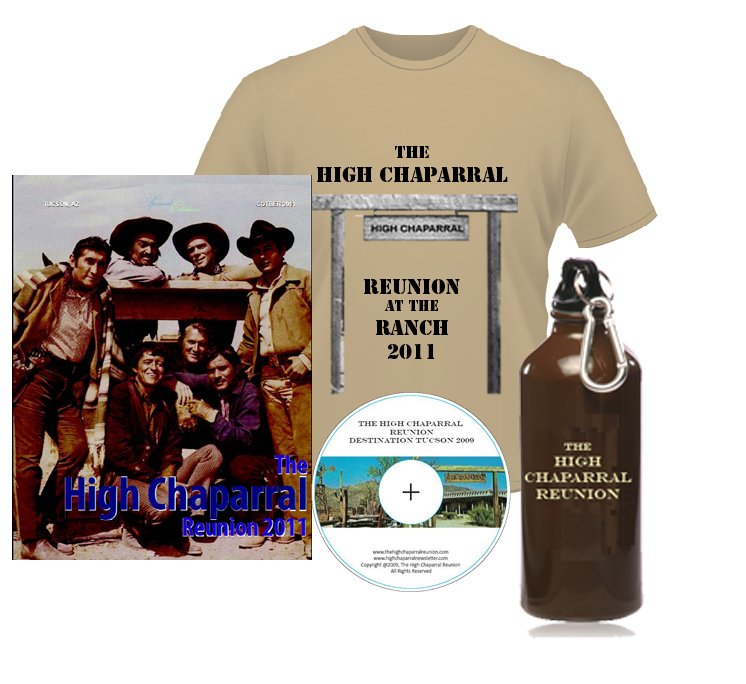 Vote for High Chaparral as your favorite TV Western at Ballot Box. 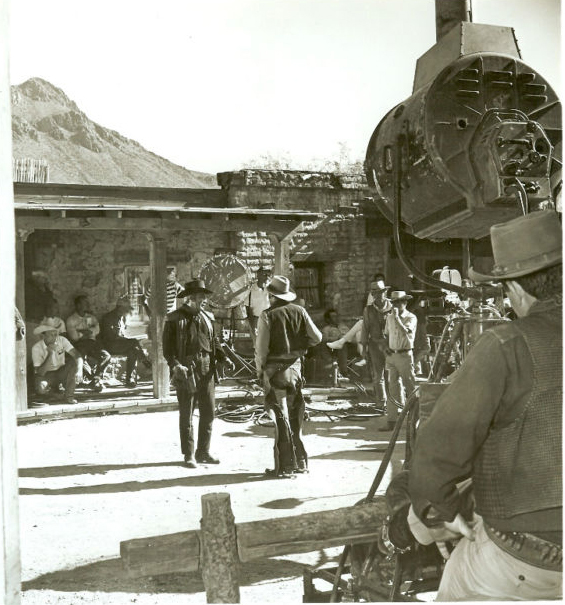 Mark Slade watches as Cameron Mitchell acts in a scene from The High Chaparral. Do you live in Australia, New Zealand, or somewhere that makes traveling there practical? Thanks for your help - and see you at the next Reunion! 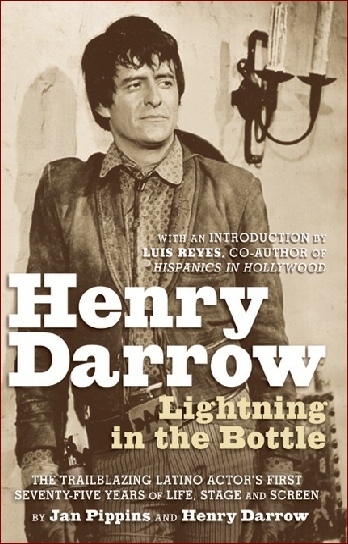 Henry Darrow's much anticipated biography Lightning in the Bottle is officially published and available for order. Fans who want a copy personally autographed by Henry Darrow can order at HenryDarrowBook.com at a special introductory price. The website also has exclusive photos from Henry's private collection. Darrow’s first horse, Diablo, wasn’t quite as good at avoiding Leif Erickson. In the initial scene where Darrow would do serious riding, he mounted up quickly and galloped through the yard to the ranch-house. Handsome black Diablo was reactive and fast. “All of a sudden, there was Leif Erickson on foot and I thought, oh my God, I’m going to run over him!” Darrow yanked the reins to turn Diablo, but wasn’t quick enough. The animal’s hip slammed into Erickson, tossing him in the air. “And that’s how I broke Leif’s wrist,” he says. “Somewhere, there’s a picture of him upside down just before he landed.” Erickson recovered with no hard feelings, but for as long as Chaparral aired, whenever anyone was on foot and Darrow rode up, he swears they took a step backward. For more from Lightning in the Bottle, order your copy and enjoy! The High Chaparral family sends condolences to the family of Holly Collier, who passed away on March 4. A Hollywood casting director, Holly Hire met future husband Don Collier during an audition for a Ford truck commercial. The couple married at Old City Hall in Tucson and made the city their home. Our thoughts are with Don and his family during this time of loss. Milt Hamerman, retired legendary casting director and talent executive for Universal Studios Television (and The High Chaparral), passed away peacefully of natural causes. He is survived by his daughters Paula and Lonnie, his son-in-law Ken Freundlich, and his sister Shirley Weiner. "Milt was my mentor ... he showed me how to become the casting director I became and for that I will always be grateful. Milt was a kind, funny, and most talented man who used his creative gifts to give so many talented people opportunities that made them stars. My husband, producer Kent McCray and I not only loved working with him on Bonanza and The High Chaparral, we loved knowing him as a friend for many years. We send our deepest condolences to his family." Nightfall by Susan McCray™ (www.nightfallbysusanmccray.com), an original hand blended eau de parfum made from 100% natural ingredients, was featured in this year’s “Everybody Wins at The Oscars®” Nominee Bag provided by Distinctive Assets. The fragrance featuring a delicate fusion of white floral and citrus essential oils—such as white rose, jasmine, and bergamot—is from Susan McCray, Michael Landon’s trusted "starmaker,” casting all of his iconic television shows and discovering such talents as Melissa Gilbert, Shannen Doherty, Paul Walker and Jason Bateman. McCray named her remarkable Eau de Parfum, Nightfall by Susan McCray™, as a tribute to a composition written by her Academy Award®-winning father, Harry Sukman. Nightfall by Susan McCray™ was in the gift bag presented to non-winning Academy Award® nominees in the categories of Best Actor, Best Actress, Best Supporting Actor, Best Supporting Actress and Best Director. Esteemed names on this prestigious list include: George Clooney, Jean Dujardin, Gary Oldman, Brad Pitt, Demian Bichir Glenn Close, Viola Davis, Rooney Mara, Michelle Williams, Meryl Streep, Kenneth Branagh, Jonah Hill, Christopher Plummer, Nick Nolte, Max von Sydow, Octavia Spencer, Janet McTeer, Melissa McCarthy, Jessica Chastain, Berenice Bejo, Michael Hazanavicius, Alexander Payne, Martin Scorsese, Terrence Malick and Woody Allen. Host Billy Crystal will also received the “Everybody Wins at The Oscars®” Nominee Bag. Just to set the record straight, Mark Slade is his real name, although any actor’s agent probably would give up half of his ten percent to take credit for it. It’s not that Mark Slade, who is in his third year as Billy Blue on The High Chaparral, is sensitive about it. It’s just that so many people are curious to know. A native of Salem, mass, the eldest of four children, Mark was well on his way toward a career as a cartoonist or a ventriloquist when he was sidetracked into acting. It was while he was a student at Worchester Academy prep school that he filled in for an ailing cast member of “The Male Animal.” That did it. Though he had worked for the sports department of his hometown newspaper drawing caricatures, and his comic strip “Sea Breeze” enjoyed a lengthy run in the Danvers (Mass.) Herald, he decided to leave for New York to study at the American Academy of Dramatic Arts. 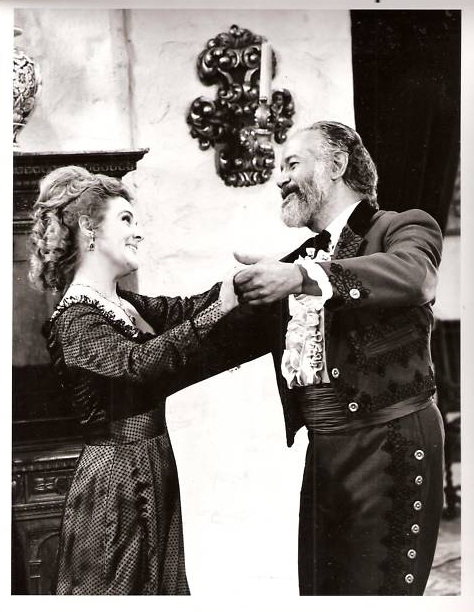 Mark Slade in "Voyage to the Bottom of the Sea"
After nearly two years of training and tryouts, he garnered his first major role – in Joshua Logan’s Broadway production of “There Was A Little Girl” which starred Jane Fonda. 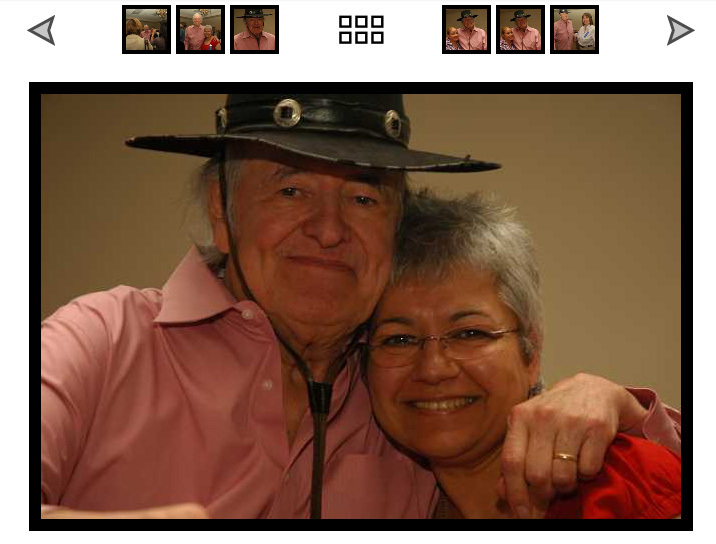 Visit the new online Reunion photo album to experience the Reunion for yourself. Remember we're on Facebook, so join the conversation there for lots more photos, memories and to meet other fans. Studiocanal, the German film distributor who has released The High Chaparral seasons 1-3, announced season 4 is available order on Amazon Germany. The Studiocanal DVDs are in PAL (European) format with both German and English language versions in Dolby sound. In the U.S an all region/all format DVD player is required to read the PAL formatted discs. 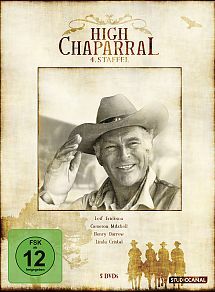 Art-S Home Entertainment, a Netherlands-based DVD company, announced it will release Season 1 of The High Chaparral in May 2012. The DVDs are planned to be to contain both English and Dutch soundtracks and will be digitally re mastered, uncut and on region-free disks. 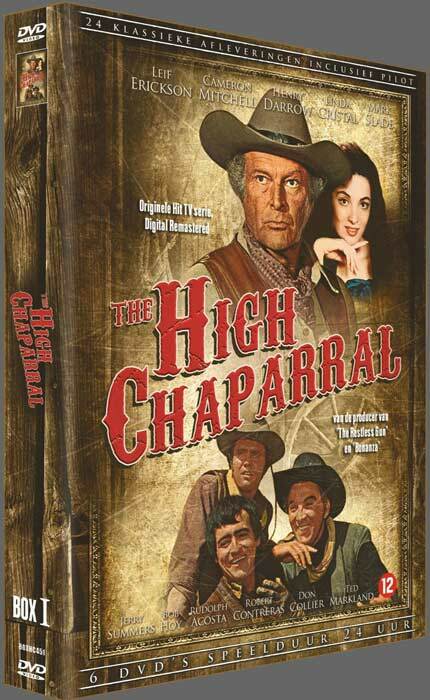 Ed note: Bonanza and The High Chaparral were both created by David Dortort. Because of this 'family resemblance' many actors and production crew worked on both sets, and fans are interested in both shows. Premiering September 12th, 1959, on NBC, Bonanza was television’s first full hour western series filmed in color. For western series, it is second only to Gunsmoke, running an amazing 14 seasons (1959-1973), and producing a grand total of 431 episodes. Facing possible cancellation after its first season [the writing was clichéd on most of the scripts and the characters were not well-rounded, except for “Hoss Cartwright”], Bonanza was saved by network executives, since they were particularly keen on promoting new RCA color television sets to an audience still using black and white sets (RCA was NBC’s corporate parent). Given a new lease on life, Bonanza settled into the Top 5 by 1961 [staying there until 1971], becoming the most popular series of the 1960s. In fact, Bonanza ranked No. 1 from 1964–1967 in the Nielsen ratings, and it still airs regularly around the world. Bonanza’s premise: a three-time widower, Ben Cartwright [portrayed by Canadian actor Lorne Greene], was one of the largest landowners in Nevada. Calling his sprawling home The Ponderosa, Ben had three sons [each from a different mother], who helped him on his ranch. Plenty of adventure was always thrown in for good measure. Greene was the ultimate authority figure. He possessed a deep, resonating voice that lent itself well to radio and various forms of narration during his long career. “The Prime of Life” , “Love Me Not” , “A Good Night’s Rest” , “To Die In Darkness” , and “Search In Limbo”  all feature excellent, nuanced performances from the actor in dramatic, romantic, and comedic settings. 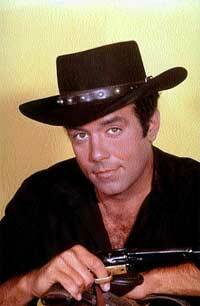 His eldest son was Adam, portrayed by Waycross, Georgia, native Pernell Roberts. He was essentially the more serious and level-headed of the brothers, very similar to his Pa. The finest example of Roberts’ acting range is in “The Crucible,” a 1962 episode where guest star Lee Marvin [playing a desert hermit] torments him so severely that Adam is virtually reduced to a crying, helpless animal at its conclusion. It is one of the greatest episodes of the series, period. Roberts unfortunately left the series at the end of the 1964–1965 season in order to seek more quality roles and return to his first passion, theatre. Actor David Canary eventually replaced him as affable ranch hand Candy Canady, who was taken in by the Cartwrights. Mind you, Bonanza was the No. 1 show in America at this time. Roberts would ultimately become a punch line for numerous comedians, including Johnny Carson, as he found little mainstream success until his comeback in 1979 with the medical drama Trapper John, M.D., on CBS. He outlived all of his Ponderosa family, succumbing to pancreatic cancer in January 2010 at age 81. 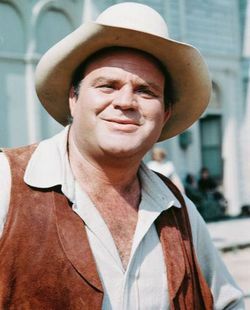 Next, actor Dan Blocker portrayed middle son Hoss Cartwright. Hoss was a very big man, able to win any fight, yet his heart was as large as his empowering frame. It’s difficult to list his best episodes, as there were so many. Blocker was probably the first cast member to totally inhabit his role during the early seasons. Viewers really believed Blocker was Hoss. Two episodes from the first season which demonstrate his fine acting skills are “The Newcomers” [the romantic scenes between Hoss and the talented Inger Stevens are heartbreaking] and [“Feet of Clay” [the scene where child actor David Ladd cries, beating Hoss’ chest uncontrollably]. Blocker passed away unexpectedly during a gall bladder operation in 1972, which ultimately led to the show’s cancellation midway through its 14th season in January 1973. Many fans consider Hoss to be the heart of the show. Actor Michael Landon rounded out the main cast as Little Joe, Ben’s youngest son. Often letting his emotions get the best of him, Little Joe was quick to fight, and many girls fell for his handsome, charming attributes. “The Truckee Strip”  may have been the earliest example of these endearing characteristics. His sense of loyalty was paramount, and if a friend was wronged, the villain had better watch out [e.g. “The Last Haircut”, 1963]. During later seasons of Bonanza, Landon developed his writing and directing skills, always wringing the emotion out of any scene he oversaw. Tragic, gut-wrenching episodes like “He Was Only Seven” and “Forever” [both from 1972] should be required viewing for first-time directors and writers. However, as an example of Landon’s impressive versatility, witness the hilarious dry wit found in “Dead Wrong” . Landon went on to even greater fame in the series Little House on the Prairie and Highway to Heaven, staying on television continually from 1959 until his death in 1991, a remarkable achievement and probable record in the television industry. So, why is Bonanza still successful over 50 years later? First of all, when younger generations watch Bonanza, the vivid color and cinematography of the series create a timeless quality. The show simply does not look 50 years old. 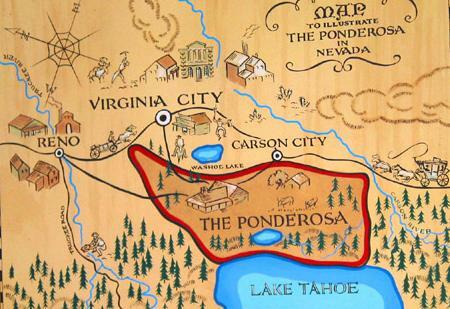 The opening credits cue a crucial, eye-catching moment as a map of the Ponderosa appears. However, it quickly erupts into a mass of burning flames. While this is happening, the instrumental theme song, driven by Wrecking Crew member Tommy Tedesco’s ringing electric guitar, roars along at full throttle [Johnny Cash later had a hit single with a vocal version]. As you can see, it’s easy to get immediately hooked. 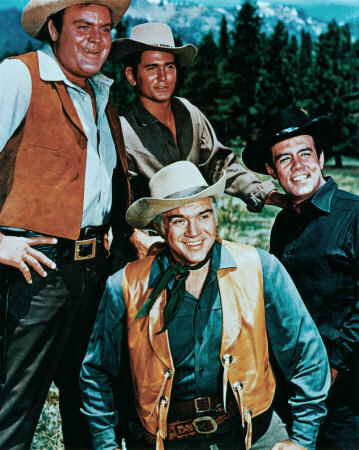 Consider this: Bonanza had its fair share of fistfights and gunfights, but the show always centered on the family bond between the four Cartwrights. Even if an attractive lady fell in love with one of the Cartwrights, the audience always knew the family would never split up. Incidentally, a number of girlfriends succumbed to bullets from a bad man’s revolver or met with a debilitating illness. Today families can still watch Bonanza without worrying about excessive violence, profanity, or sexual themes. A strong sense of morality maintained the show’s backbone. Episodes were not strictly shoot-em-ups, either. Bonanza was innovative in devoting full episodes to comedy that actually worked, often focused on Blocker and Landon’s strong sense of comedic timing [i.e. “Hoss and the Leprechauns” (1964), “Ponderosa Birdman” (1965), “Ponderosa Explosion”, “Maestro Hoss” (both 1967) or “The Last Vote” (1968)]. Little Joe would always encourage his older brother in these harebrained, sometimes get-rich schemes, while Pa Cartwright played the consummate straight men. Joe’s impish laughter, displayed on occasion, was especially contagious, too. Racism was addressed on Bonanza during a time when it was not fashionable to do so, ranging from the persecution of Chinese workers [“The Fear Merchants”, 1959] to the horrific effects of slavery. For example, Michael Landon wrote and directed an episode entitled “The Wish”  that dealt with Hoss trying to help a black family combat prejudice after the Civil War’s conclusion, one that Landon called his favorite of the entire series. The writing and direction were also commendable. Storylines were never convoluted, always following a logical progression. The majority of episodes did not follow a serial format like many modern-era programs, ensuring channel surfers to perhaps pause and view an episode without having to dwell on the back-story. The four main leads were all highly skilled, proficient actors, able to make the audience believe and identify on some level with whatever situation they faced. For example, when Little Joe had terrible nightmares due to his fear of heights [“Between Heaven and Earth”, 1964], the viewer felt his anguish. Notable guest stars are also a draw for audiences. It is amazing to spot all the stars that did some of their earliest work on Bonanza, including Telly Savalas, Charles Bronson, James Coburn, Jodie Foster, Marlo Thomas, Dennis Hopper, Jack Lord, or Carroll O’Connor. In a lost art form, each guest star with a significant role was featured in the opening credits, posing in costume with their name then listed underneath. The current popularity of Bonanza shows no sign of wavering. Much of the credit should be given to creator and producer David Dortort and his extraordinary vision for the show. 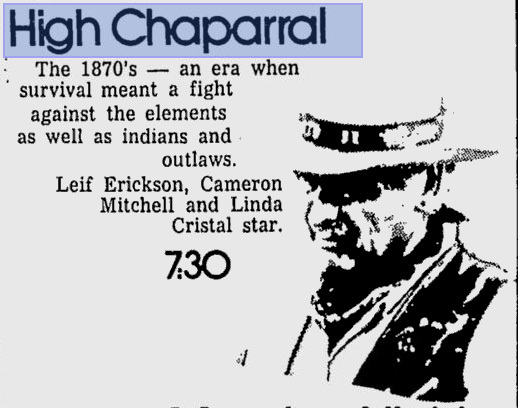 By the way, he also created another popular western series centered on a family, their vast ranch, and their many adventures entitled The High Chaparral [1967–1971]. The first season of Bonanza finally arrived on DVD in 2009 to commemorate its 50th anniversary. In a gesture meant to squeeze more money out of fans, each season is split into halves with 16 episodes per release. Thus far, only the first and second seasons are available. At 14 seasons, it is difficult to determine how many years it will take for the full show to be available. Consequently, unofficial DVDs are rampant, especially of the first two seasons [a number of those episodes are in the public domain]. TV Land is the primary home of this classic show. Two newer, smaller networks with limited but growing affiliates [My Family TV and Me-TV] also carry the series. Unfortunately, over 150 episodes between 1965 and 1973 [the years after Roberts’ departure] are not part of the syndication package and are rarely shown. A number of episodes, including the later seasons, can be seen on YouTube. Bonanza is the epitome of television excellence, and thanks to syndication, new generations will continue to discover this classic western series for years to come.